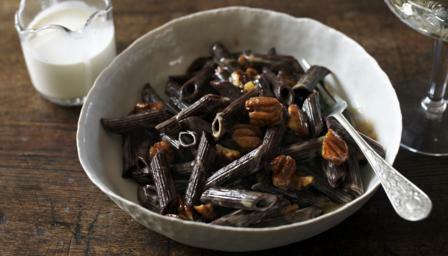 This is really Anna del Conte’s recipe, only I in slovenly fashion use shop-bought chocolate pasta. The ready-made stuff is not available everywhere, but it is worth tracking down for this unconventional but intriguing sweet treat. Put water on to boil for the pasta and, when it’s boiling, add a pinch of salt and cook the pasta, setting a timer for two minutes before the packet instructions say it will be ready. Put a medium-sized, non-stick frying pan on the stove and tumble in the pecans, then toast them over a medium heat. Once you can smell their scent wafting up from the pan, remove them to a cold plate. Now stir the butter and sugar together in the frying pan until you have a hot, treacly syrup. Carefully pour in the cream, stir and let the caramel mixture bubble up, add the toasted pecans and a pinch of salt, then turn off the heat. Just before draining the pasta, lower in a cup to remove a little pasta-cooking water, then toss the drained pasta back into the frying pan with the dark and nutty butterscotch sauce, adding a tablespoon or two of the cooking water if needed to help coat the pasta. Stir to combine before dividing between two bowls. Serve with a little double cream in a small jug to pour over as you eat, if wished.